And it’s a big one for us – Volume 30! 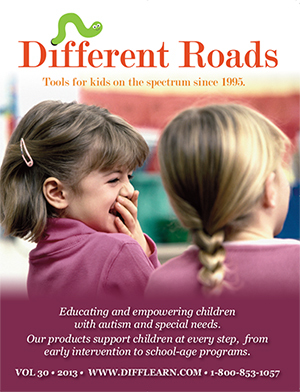 Over 18 years and 30 catalogs, our mission has always stayed the same: to educate and empower children with autism and special needs. We’re so proud of our 30th Catalog and we think you will be quite excited by the 70 new products that we’ve added. We’ll be highlighting and featuring some of our best new products in our Pick of the Week segment so be sure to keep an eye out for special offers by joining our mailing list. The new catalog contains all of your favorite go-to’s, like the Language Builder and the Time Timer, along with spectacular new products for Early Intervention, teaching social skills, developing conversation and so much more. You can always request a paper catalog on our site, or you can click here for our fully interactive e-catalog that enables you to dowload, print and link back to the products on our site. We’re thrilled to share this milestone with you and can’t wait to hear your thoughts on our new products. Written by: Different Roads to Learning on April 1, 2013. This entry was posted in ABA, autism, Autism Awareness, autistic spectrum disorder and tagged ABA, Applied Behavior Analysis, autism, autism education, autistic spectrum disorder, Different Roads to Learning, Resources, social skills, special needs, teaching tools, visual supports by Different Roads to Learning. Bookmark the permalink.